Bengal Ganga was designed as a replica of the colonial style ‘Clyde’ steamers that at the height of Empire trudged through swamps and far flung deltas; in particular, similar ships employed were used by a succession of important officials and celebrities of the day, most notably recorded as being used by Viceroys of India and the Prince of Wales. Shining Teak and Brass lined state rooms opening onto similarly equipped promenade decks with rattan sitting areas. The 28 state rooms today can still ensure a fantastically comfortable and elite travelling style. ‘Improvements’ to meet today’s needs such as the saloon bar, dining room and observation deck are crucial facets of enhancing what otherwise would be long distance road travel, that can be arduous and frustrating at best of times. After a gruelling sea voyage from Burma, the ship entered India in April 2009 to Kolkata Port, when a cyclone left her severely damaged. As rare an event as the immigration of an inland river ship, the Indian Register of shipping specifications meant that repairs could not be undertaken until 3 months later, when customs clearance had been granted. Finally with the much needed facilitation by the Government of India Tourism, the Inland Waterways Authority of India including the Ministry of Shipping, and the Government of West Bengal, Bengal Ganga was confirmed as an Indian Ship on the 27th September 2009, merely 24 hours before the inaugural voyage. True to form, bureaucracy was troublesome, but ensured a thorough understanding of local by laws and a greater appreciation of the ship itself. A reminder of the equal value of both the destination and the journey. Against all odds Bengal Ganga’s maiden voyage, and the first Ganges passenger cruise in well over 100 years were completed by September 2009. There was never a dull moment from start to finish: broken propellers and rudders a regular occurrence, with hindering inclement weather, and the constant battle against unprecedented urban development forming ‘barrages’ of aerial wires and bridges. These had to be subverted in order to reach Farraka Lock: the gateway from the Hooghly to the Mother Ganga, leading the ship on to Varanasi. At this point it has to be said that the resilience of the crew and the full backing of the Governments of West Bengal, Bihar and Uttar Pradesh in tandem with the Indian Waterways Authority of India resulted in a speedy and efficient round trip, arriving back in Kolkata on schedule. Covering 1200 kms the routing offers a sumptouous feast of cultural and historical precedence: Kolkata, Chandernagore, Bandel with British, French, and Portuguese architecture, terracotta temples at Kalna, Murshidabad with it’s Moghul Palaces, museums and mosques, Raj Mahal and the Moghul monuments, the Munger School of Yoga, Nalanda, Vikramshila the 8th Century ancient Buddhist University, Bodh Gaya where Siddhartha Gautama attained enlightenment, Patna museum, Sarnath, and the oldest living city in the world Varanasi, like the Ganges, the list is long and rich. Whatever your interests there is nothing that Mother Ganga can’t tempt you with. Village life, colourful festivals, amazing archaeological sites, museums, temples, wonderful scenery and a rich tapestry of natural history that can be observed as the ship proceeds steadily along. This ‘diamond in the rough’ harbours some of the large endangered mammals such as Bluebull and Blackbuck Antelope, Wild Boar, Jackal, Bengal Fox, Jungle Cat, Rhesus Macaques, Grey Langurs and for those with sharp eyes good chances of Indian Mongoose. Not only the banks, but the channel itself hosts over ninety species of fish, Smooth Indian Otters, Terrapins and Tortoises as well as healthy populations of River Dolphins. Thousands of migratory ducks can be seen, as well as Indian Skimmers, Storks, River Lapwings, Kingfishers and birds of prey. 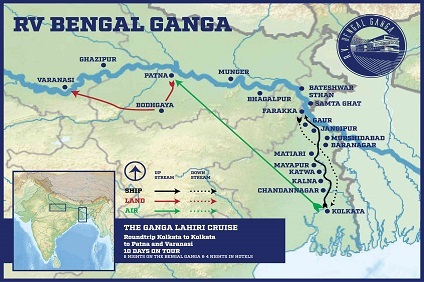 From an uncertain explorative start, our maiden voyage mistakes have allowed us to hone the Bengal Ganga Experience. 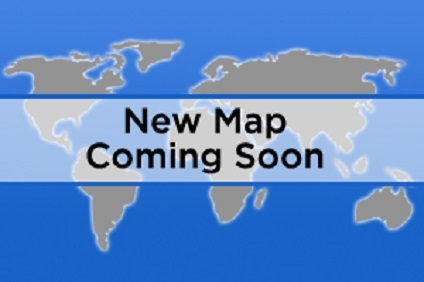 We now have a fully trained crew, improved cuisine and excellent housekeeping. 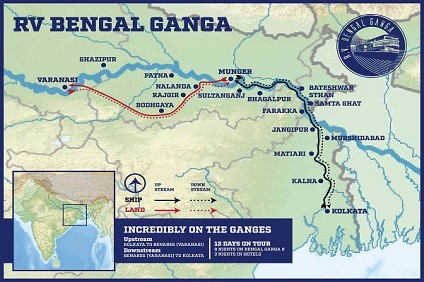 The Bengal Ganga Experience with the knowledge and enrichment given by the Mother Ganga herself gives clients the elegance of travel with the cultural and spiritual growth that is offered by this unique catchment. The journey is the destination. 7 Night Cruise sailing from Kolkata roundtrip aboard Bengal Ganga. 8 Night Upstream Cruise sailing from Kolkata to Munger onboard Bengal Ganga. Hotel stays post-cruise in Bodhgaya and Varanasi. 8 Night Downstream Cruise sailing from Munger to Kolkata onboard Bengal Ganga. Hotel stays pre-cruise in Varanasi and Bodhgaya. Meal times are indicated in your Daily Program. Special dietary requirements may be catered for, with advance notification. Enjoy our extensive breakfast buffet, a lunch buffet with some served dishes on occasion and in the evening a sit-down dinner. Our Chef will endeavor to delight you with specialties from some of the regions through which you will be cruising. There is just one sitting at meal times and in order to ensure a smooth service for sit-down dinner, we ask that you take good note of the starting time and arrive promptly. There is unassigned seating in the dining room at all times. We kindly request our guests not to take food out of the dining room. Weather permitting, early riser’s Tea or Coffee and bar services will commence outdoor only on the Sun Deck. All meals onboard are prepared by highly experienced chefs and consist of primarily Indian / European-style food. We hope you will find each meal a wonderful culinary experience. The dress code onboard is “casual and comfortable”. Gratuities to the ship’s crew are not included in the holiday price. In response to the feedback that we have received from our previous passengers on the Bengal Ganga, we have made arrangements to add gratuities to your onboard account, which is payable at the end of your voyage. Please note though that gratuity payments are entirely discretionary and that you are welcome to opt out of this system or, indeed to alter the amount of the gratuities that you would like to be added to your account. Should you wish to pay gratuities separately to your onboard bill or charge the amount that is to be added to your account, please notify the manager during your voyage. Please refer to your Traveler’s requirements for information regarding tipping ashore while on organized shore excursions. Gratuities to your Cruise Director / Expedition Leader and Tour Manager are not expected. However should you wish to offer a gratuity for exceptional service, then this is entirely at your discretion.